Essex’s marshlands are a damp reminder of a break-up that the British are yet to come to terms with. Around 8,000 years ago, Doggerland, the landmass that connected the UK to the European mainland, was submerged under newly melted waters eventually named the North Sea, isolating a collection of hills, valleys and plains, and creating what is now the eighth largest island in the world—the home of England, Scotland and Wales. Lives can only be lived on much of Essex’s eastern fringe because these lands were drained centuries ago, reclaimed from the same saline fate as Doggerland. According to Ian Yearsley’s authoritative book, The Islands of Essex, the county is home to around 40 islands of varying size dotted around the open sea, creeks and inlets of its coastline, from the large expanses of Canvey and Foulness, to marshland fragments such as Little Cob or Lower Horse island. The largely uninhabited ‘Essex archipelago’ contains Wallasea, Potton, Rashley, New England, Havengore and Foulness, which is used by the Ministry of Defence as a base for weapons testing. Much maligned, Canvey Island was reclaimed by the Dutch and later built on by Londoners trying their luck, freehold by freehold. 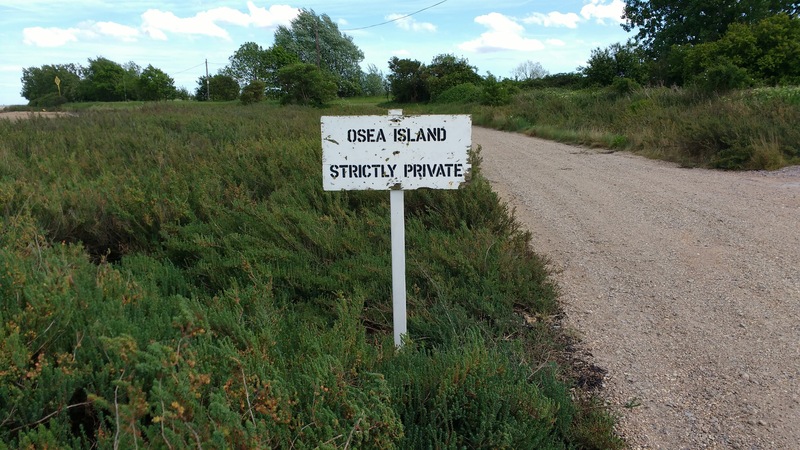 While Osea Island, in addition to being home to all manner of migratory birdlife and two second-world-war pillboxes, is currently Essex’s most sought after events space. Growing up in Southend, my childhood trips to the Essex seafront were characterised by the booms of ballistic experiments and bomb disposals. Foulness Island, at the northern lip of the Thames Estuary and a few miles east of my hometown, has been a military testing site since the middle of the 19th century. The Ministry of Defence is the landlord of the 6,000-acre island, which is operated by the private firm QinetiQ. Walking the ancient Broomway path at low tide recently, our party kept noticing sabots embedded in the grey-brown mud, discarded from tank shells that had been fired into the wet sands. In 1973, plans to build Maplin airport here received royal assent. Had it been constructed, it would have boasted four runways and nine terminals by the late 1990s, serving a projected 120m passengers a year. Aircraft would have landed and departed at sea to keep noise down. A new town to house 600,000 people was also to be built on the island, alongside a seaport—all connected to London by an eight-lane motorway and high-speed railway. During my youth, Southend seemed at the edge of nowhere, the end of the line, but here it could have been a twinkling beginning. But the barbed wire and emptiness may have contributed in part to saving these salt marshes from development. The MOD had a civilian workforce clear the land of projectiles for the new airport, intending to relocate their activities to the Scottish Highlands. This upheaval was part of a growing list of problems with the endeavour, which was eventually thrown out as too costly once Labour formed a minority government in 1974. Since then, the island’s civilian footprint has receded. In the 2001 census, Foulness’ population totalled 212; by 2011 it was 151. Foulness was used as an atomic research facility during the mid-20th century, but following 9/11, assessments of the military capabilities of organisations such as al-Qaeda were being made here instead, including the testing of explosives. Do residents notice this side of island life? ‘There’s the odd occasion when it will rattle the windows but it’s just like having trains at the bottom of your garden. You get used to it,’ says Mary. There is also evidence of unrest among farmers on the island. In the late 2000s, academic Matthew Flintham talked to a few who had to organise their agriculture schedules around military testing, which meant working at night to harvest fields closed to them during the day. One farmer spoke of his annoyance at QinetiQ after they didn’t heed his advice about strong winds before starting a fire of decommissioned mines, which then spread to his neighbouring field, burning his crops. Some fear numbers will dwindle further, but Mary thinks the population has stabilised. And there are certain benefits to living on MOD turf. ‘The roads are always kept in a state of good repair. And there’s somebody around doing grass maintenance the whole time, so the island looks neat and tidy.’ Yet there is one eventuality even the military can’t control. By rights this land should be a drowned world. It was reclaimed by the North Sea flood of 1953, an event that served as a reminder of the precarity of the Essex island, and of which Hilda Grieve’s exhaustive 1959 social history The Great Tide is a peerless account. Trundling towards Osea Island in the Blackwater estuary, along a rocky causeway that dates back to the Romans, I catch sight of two oystermen out on the mud picking light grey specimens, which I initially mistake for thousands of tiny stones. This road is only passable twice a day at low tide, and so the island’s manager, Jon, is taking us across in his Land Rover before it’s freshly submerged by saltwater, a process that makes the island also accessible by boat. During storms, large rocks are often thrown onto the causeway, and cars can sink if they steer onto the flats to avoid them. ‘We run it like a military operation. We’ve saved several people from the mud,’ says Jon, who keeps JCBs and Land Rovers on standby to help get them out. Nigel Frieda, the press-shy record producer famous for launching Sugababes, might have owned Osea since 2000, but from where I’m sitting, Jon is king of all he surveys. He heard about the eye-shaped island when he used to run pubs in Northampton. ‘This local lad comes up to me and says, “I’ve got a friend who needs a hand with an event”. He told me it was on an island and it sounded pretty far-fetched.’ After just one visit, he chucked in the pub game, cancelled a holiday, and has been working with Nigel ever since. Frederick Charrington, heir to the old East End brewery firm that bore his surname, bought the island in 1903 to set up an experimental temperance colony for ‘inebriates’, in the style of a similar scheme in New York, after dedicating his life to fighting the alcoholism that the family trade encouraged. ‘The island is well wooded, with high elms running in single lines north and south and east and west, the trees being in centre of avenues, and by planting young trees on either side we shall get double avenues, as in Chicago and Berlin,’ Charrington said of Osea. The buildings, he added, were to be ‘picturesque, half-timber dwellings, similar to those in the city of Chester’. His noble pursuit was influential in its day, but not entirely successful: he hadn’t accounted for scheming Essex boatmen selling smuggled booze to the island’s inhabitants by night. After Nigel bought the island, he and psychiatric nurse Brendan Quinn tried to revive its role as a rehab centre. The Causeway Retreat looked after Amy Winehouse, among other high-paying guests. But the place was shut down in 2010, the judge presiding over the ensuing case eventually likening the facilities to that of a ‘third-world country’ due to inadequate levels of staffing and general care. Sarah Mulvey, a Channel 4 executive, killed herself after a crisis that her father claimed was precipitated by being told to leave Osea at 20 minutes’ notice. Quinn, who denied in court that such an event occurred, was struck off, and Nigel turned his attentions here to music production and events. Jon drops me off at the captain’s house, hands me his keys, and invites me to explore the 400-acre private island. I begin an anticlockwise circumnavigation, heading for a second-world-war pillbox on Osea’s far eastern side, noticing rabbit droppings as I jump across a stream towards the island’s walled outer edge. Later, from the perimeter of a field, I spy a peregrine swooping from a tree to a field far below. As I sit by the pillbox, eating a sandwich in the high sun, a holidaying couple appear. We make small talk and I ask them what it’s like to escape the bustle of the mainland. They tell me it hasn’t exactly been a retreat to the wilderness, as they’re staying in ‘the village’ at the island’s centre, which has been a hive of activity with all the events that have taken place recently. Walking around its perimeter, Osea starts to feel like a rather small, enclosing place – a mix of scorching sun and relentless wind adding a surreal, almost 2D quality. I feel like Patrick McGoohan with heatstroke as I reach the village, and the clash of sleepy, Essex weatherboard cottages and the bizarre mock-Tudor and pebble-dashed flourishes introduced by Frederick Charrington comes across like a petite Portmeirion. On Osea you can get married, or simply holiday with friends or family, if you can afford it. The manor house and the captain’s house both sleep 20 and are luxuriously fitted and furnished. The catch being that you may have to contend with concurrent events. In the past, the team here have set up everything from axe-throwing contests to cross-country Segway courses for clients. An old warehouse where the navy once manufactured torpedoes is now a party space called the Bomb Factory. Last week, Osea witnessed a corporate function for a big multinational bank. I pass Jon’s staff setting up tents, with plush beds and wifi, ahead of an eight-day event for a wellbeing brand attended by Instagram-friendly lifestyle gurus, CEOs and journalists keen to practise Zen and the art of personal brand maintenance. At high tide, I wave Jon goodbye and leave the island by water taxi. In the boat with me sit PR and music industry folk returning from site visits, checking for a signal and itching for the city. It doesn’t take long for Osea to recede into nothing. Canvey is easily the most ‘Essex’ of all the islands. People speak their minds and are not afraid to crack a joke, styling out their fate as a national punchline. It’s part of the streak of housing I grew up in, which swamps the county’s south, all the way from Basildon to Shoeburyness. This suburban conurbation, built over field, marsh and forest, was derided from the start by the better-heeled commentariat, with Canvey bearing the worst of it, for the temerity of its unplanned bungalows and holiday cottages. And the island is looked down upon by the mainland in more ways than one: islanders live below sea level. Most of its 58 victims of the 1953 flood drowned, some engulfed by seawater as they slept, but some died of the cold while awaiting rescue. A steel and concrete wall has prevented a repeat of the tragedy, but some still fret about future flooding. As sea levels rise, a process of ‘managed retreat’ is in play on less densely populated marshland such as Wallasea Island, north of Foulness. Farms are closed and arable land turned into RSPB wetlands, with sea banks built from clay and soil excavated during London’s Crossrail project. It is hoped such initiatives will help protect populated spots such as Canvey. In 1866, the island claimed just 111 inhabitants; now it’s pushing 40,000. In the intervening years, East End pioneers moved to the island to begin new lives. Entrepreneur Frederick Hester divided up farmland he’d bought during the agricultural depression into plots, marketing them as a place to holiday, supplying ‘murky London with yet another lung’. Hester became a kind of godfather of Canvey, building a monorail and exotic winter gardens, and planning to turn creeks into grand, Venetian-style canals. His desire to turn the island into a dream destination was so strong he overstretched his finances, and filed for bankruptcy in 1905. But Hester’s legacy lives on. Pick an islander at random and chances are you’ll trace their origins to London. One of Canvey’s newest recruits is Joel Friedman, whose family is part of the Haredi Jewish community currently relocating from north London’s Stamford Hill to the Essex marshes. Joel and I gaze out at the Hadleigh Castle ruins, high above the Thames Estuary flatlands, from the window of the former Castle View School library. Broken crayons crunch underfoot, while behind us the shelves lie empty, but Joel has plans to turn it back into a functional library, replete with crèche, as part of a new school. Joel and I stop to watch a train darting eastwards on the mainland, from Benfleet to Leigh-on-Sea, laughing at how tiny it looks as it fringes the bottom of the hills by Hadleigh Castle. He shares his hope that the Canvey settlers are the first of many Haredi communities to make the surrounding area their home, recasting Essex itself as an island, a beacon—a loam foothold for dreams once more. Essex, An Island off London, is taken from Somesuch Stories Issue 3, which is available for purchase worldwide. Tim Burrows co-authored Trying to Fit a Number to a Name: The Essex Estuary out now via Influx Press.